Certain Notebook and PC such as 10.1 inch Netbook unable to support Metro UI by default.This is because 10.1 inch Netbook maximum resolution is 1024 x 600 where minimum requirement for Metro UI is 1024 x 768. So in this tutorial we will make changes to Registry Editor which will improve your Maximum resolution required to run Metro UI. 1. Open your registry Editor by : Press Windows key + R button and then type REGEDIT and press enter. 2. 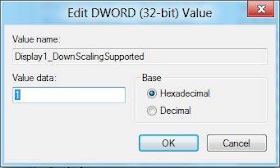 A registry Editor will open, now we want to look for Disply1_DownScalingSupported . To do that simply press CTRL + F button on your keyboard and type Disply1_DownScalingSupported and the press enter. 3. Double Click on it and change the value from 0 to 1. Now reboot your PC for changes to take place. 4. 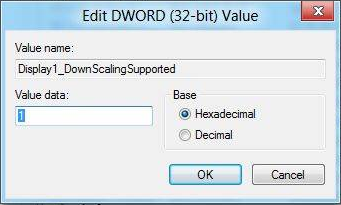 Now go to Display setting and you will see you will have new maximum resolution and commonly it is 1152 x 864. Change your maximum resolution to use Metro UI.